If you’d like to make your own tempeh “bacon” to use in TLT wraps or as a side for tofu scrambles and such, here’s an easy and tasty way to do it. Prepared products like Fakin’ Bacon) are good, but this DIY version of tempeh bacon allows you to control the flavor and tweak it to your liking. You’ll need just a few ingredients to make tempeh — and lots of other things — taste like bacon. 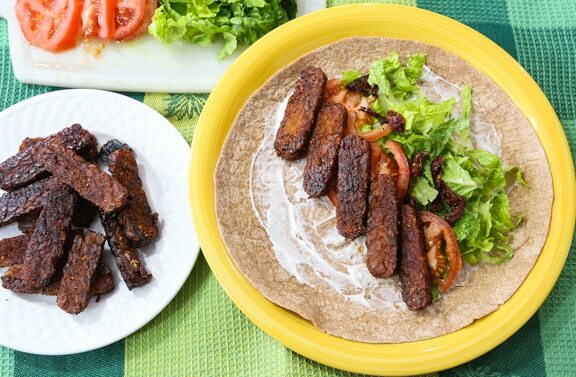 Tempeh bacon, lettuce, and tomato wraps are perfect for a portable lunch or a light dinner. You’ll find liquid smoke and barbecue seasoning in the spice section of well-stocked supermarket. There’s often a section of barbecue seasonings. Check labels carefully; they’re not all vegan! 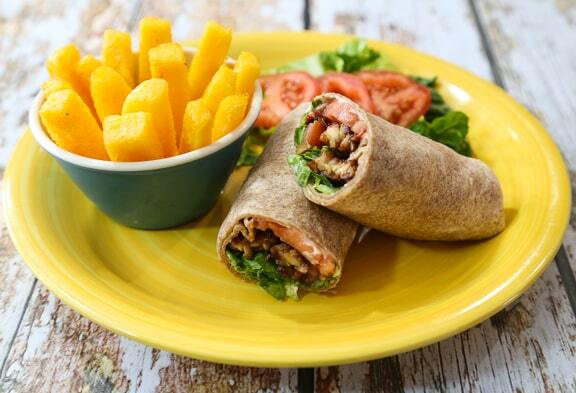 Shown here with the wraps are Fuss-Free Baked Polenta Fries. They’re a great pairing with the flavors of the wraps. Or, you can serve with a simple potato dish or sweet potatoes. For lunch, just add fruit. If you’d like to make your own tempeh “bacon” to use in wraps or as a side for tofu scrambles and such, here’s an easy and tasty way to do it. Cut the block of tempeh into ¼-inch slices crosswise. Heat the syrup, soy sauce or liquid aminos, oil, and liquid smoke in a wide skillet, stirring together as everything heats up. Arrange the tempeh in the skillet in a single layer. Turn the tempeh slices over nearly as soon as they go in. Cook over medium-low heat for 4 to 5 minutes, or until the under side is starting to brown, then turn the slices over again. Continue to cook until the second side is starting to brown as well. Sprinkle in the seasoning, then stir everything up with a spatula until the seasoning is well distributed. Remove from the heat; taste and see if you’d like to add more of any of the other flavorings. 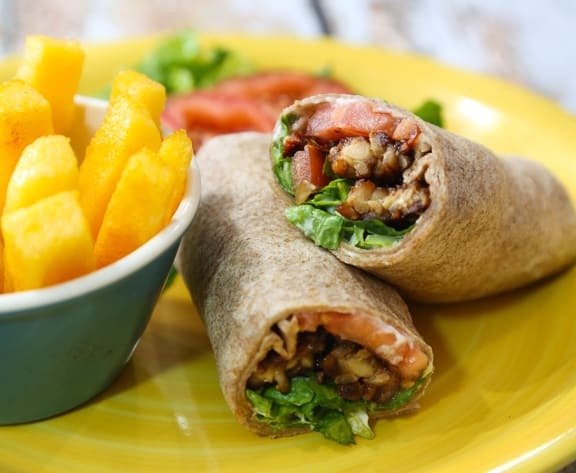 For each wrap, place one wrapper on a plate and spread with mayo. Arrange lettuce, tomato, a few optional sun-dried tomato slices, and 5 or 6 slices of tempeh bacon, more or less in the center as shown above. Fold a small part of the wrapper over two ends of the ingredients, then roll up snugly. Cut in half to serve. Here are more of our vegan sandwiches and wraps.